The Fern and Mossery: Moss Monday: What to do with dried sphagnum moss? Moss Monday: What to do with dried sphagnum moss? Q: I don't know anything about moss. I ordered some live sphagnum moss from Amazon and it came dried in a plastic bag. I'm not sure what I should do with it. Do I need to soak it in water? And what should I plant it in? I'm confused! A: Sphagnum moss is a common material used for gardening and making terrariums. Gardeners use it to line hanging basket frames, pad topiary frames and even mix it into soil. I recommend using soaked sphagnum moss as a filter layer between the soil and charcoal layers in a terrarium (read more about how to add soil and other layers to a terrarium). 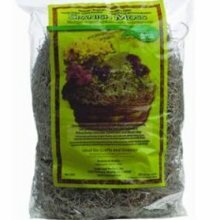 In some cases, dried craft or garden sphagnum moss can be revived into a green, thriving moss. You can read my tips for reviving dried sphagnum moss - but I don't recommend this difficult method as a primary means of gaining live moss for use in the planted area of a terrarium. Instead, look for some healthy, living moss elsewhere. Try the shady side of buildings, in sidewalk cracks or in potted plants. And don't forget to wash your moss!